Fiber Mate Tablets - Natural Stool Softener is made from the highest quality vegetables and herbs free from harmful sprays providing natural occurring vitamins, minerals, enzymes, friendly intestinal probiotics(DDS-1 strain), chlorophyll and healthy food fiber necessary for a healthy intestinal tract, regularity, and even freshens your breath. The Gluten Free & Dairy Free formula is free of psyllium, cascara, senna, oat, wheat bran, ground flax seeds that can each be very irritating to the intestinal lining. Great for children and adults! Fiber Mate Tablets - Natural Stool Softener * is made from the highest quality vegetables and herbs free from harmful sprays providing natural occurring vitamins, minerals, enzymes, friendly intestinal probiotics(DDS-1 strain), chlorophyll and healthy food fiber necessary for a healthy intestinal tract, regularity, and even freshens your breath. Gluten Free & Dairy Free formula is free of psyllium, cascara, senna, oat, wheat bran, ground flax seeds that can each be very irritating to the intestinal lining. Each 3 tablets of Fiber Mate is approximately 1/4 cup of green vegetables which aids to freshen your breath, acts as a natural diuretic for unwanted water weight and supports daily nutrition and regularity. Contains 16 vegetables and herbs to include anti-parasitic herbs, building nutrients, which support a decrease of candida (yeast) and unhealthy bowell conditions Fiber Mate includes; Beets, Apple Pectin, Carrot Fiber, Whole Leaf Aloe Vera, Sprouted Wheat grass, Alfalfa Powder, Black Walnut Husk, Kelp, Jerusalem Artichoke, and more. It is wonderful for nursing and pregnant women and helps with infant constipation if mother is breastfeeding. When taken with Aloe Life juices Fiber Mate supports detoxification and tissue cleansing that may lend support for a healthy liver and optimum health of the body. Directions: 3-6 tablets taken daily, amount varies per individual needs. 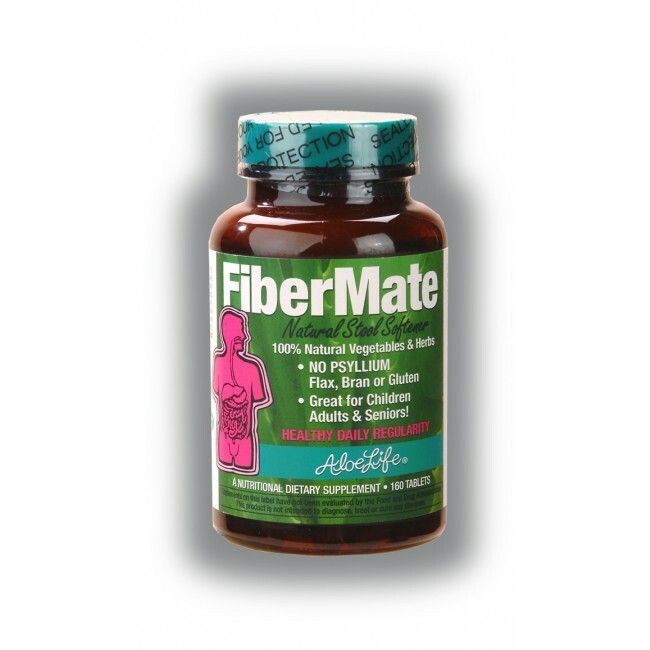 Fiber Mate is not a laxative (considered a stool softener and regulator) and can be used daily. Fibermate is very effective but is not a bulking fiber so make sure to include plenty of raw scrubing vegetables in the diet as tolerated such as carrots, celery, cabbage, beets, etc. Great for children and adults. *Tablets can be ground finely in a coffee grinder, etc. for toddlers or individual who prefer powder. The FM Powder will be back in stock 2014.